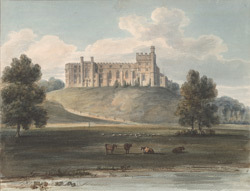 View of the east side of Arundel Castle, the seat of the Duke of Norfolk. The dukes stayed here only infrequently during the 18th century and consequently the castle was neglected. William Gilpin wrote in 1774: "at present it is by no means fit for the reception of a ducal revenue ... you see everywhere a thorough want both of repairs and furniture, and in all parts evident tokens of the contempt of its master." It was substantially enlarged between 1791 and 1815, however, when the serving Duke of Norfolk employed Robert Abraham to build the Gothic-style apartments. From 1890 to 1903, the castle was almost entirely rebuilt by CA Buckler as a faux- medieval structure, incorporating the original medieval keep.